I have been trying to find in any local histories anything about white settlement in this area so as to reproduce it in the Whisper, and haven't come up with much, except the paragraph below quoted in full from Page 14 of Gundaroo, by Errol Lea-Scarlett, 1971 (available at the Queanbeyan and Bungendore Libraries). "While the scramble for river frontages was taking place in the mature parts of the Yass River there was little interest in purchasing freeholds higher up. William Guise bought a few sections which enabled him to run his flocks, if he wished, on unpurchased land between them, and the only other purchaser in the rough ranges near the source of the Yass River was William Moore. Guise's blocks in the high country were first applied for in 1837 by Stephen Burcher of Liverpool who, although unsuccessful in his bid, is commemorated in "Bircham's Creek" which, with Kowan Creek, forms the source of the Yass River. William Moore of Piper's Hill, Campbelltown, purchased 640 acres at the head of Brooks Creek, on the track from Gundaroo to Bungendore in 1838 and for many years lived quietly but industriously on his property which he named Creekborough. He died there in January 1861 aged 84, and the property was not long afterwards purchased by John Walker." Back in the 1920's, my grandfather Frank Hyles was building up his sheep numbers and land holdings in the Wamboin area. He owned land in central Wamboin that was called Cannings, Merino Vale, Birchmans Gully, Brooks and Leahys. The best land he owned in the area would have been Old Kowen and Merino Vale. There was a mud hut on Old Kowen about one kilometre south of the intersection of the Yass River and the present location of Norton Road. Even today I have two paddocks I call Mud Hut East and Mud Hut West. One person who lived in the mud hut was Mr. Flanagan, his wife and child. He worked for my grandfather and wrote him a letter which is reproduced below. It was written in 1925 and unfortunately I have no more information on the Flanagans apart from the letter. In 1951 the Korean War created a wool boom and my grandfather decided to purchase two Fiat bulldozers. Jack Welch delivered the bulldozers as a salesman for Tutt Bryant. Jack ended up living in Wamboin for 25 years (1951–1976) and being with our family for 38 years, mainly working for my father Peter Watson at Wamboin or Murryong. Whilst living at Wamboin, Jack Welch built dams, fences, cattle yards and planted crops, pastures, windbreaks and two large forestry plantations for my mother and for Dr. Bruce Shepherd. Each plantation in Wamboin is about 500 acres of radiata pine now being harvested or nearly ready to be harvested. As you drive from Bungendore to the Wamboin shop on Norton Road (Ed. The shop used to be on the corner of Bingley Way and Norton Road) you can see a yellow farm house in the distance looking south towards Kowen Forest. Jack and Nita Welch raised six children, Peter, Steven, Allen, Gregory, Evelyn and Karen, in Wamboin between 1951 and 1976, and their access was via Kowen Forest to Molonglo Gorge forestry road. The land off Bingley Way used to be called Cannings. The land from Bingley Way to Weeroona Drive along Norton Road and all the land off Merino Vale Drive was part of Merino Vale. Leahys now belongs to Bruce Shepherd. Brooks is the Norton Road and Ryans Road land and Old Kowen is still with me. My grandfather Frank Hyles sold 5000 acres of the above land in 1950 and this now forms a larger part of central Wamboin. This land was managed in the 1940’s from Murryong down on the Kings Highway and sheep for shearing would go down to Murryong. Click here to view an overlay of the Merino Vale subdivision on the present map of Wamboin. Cannings was purchased by Ernie Armour and run by his son Ian Armour before he sold it to a land developer in about 1972. Ian Armour had good sheep and wool and was also a wool classer. He now lives in Canberra. The Armour’s homestead was on the Sutton Road towards Queanbeyan near Norton Road. Merino Vale was purchased by the Harriotts in 1950 and then they sold it to the Majors in about 1962. The Harriotts and the Majors improved the pastures near Merino Vale Drive and Norton Road near the Yass River crossing. After they sold Merino Vale, Barney Harriott purchased two small Mercedes livestock trucks. Mrs. Judy Harriott was the sister of Norm Shepherd, famous as a Toyota truck and car dealer in Fyshwick. She was a hard worker on the farm, spreading superphosphate and later driving a big semi-trailer carrying livestock throughout southern NSW. Birchmans Gully was owned by Bob Denley, a shearer, and his family was based on the Sutton Road, apparently. Also the Bingley family owned Leahys for a while and the Ryan family owned Brooks. The Ryan family relocated to Gundaroo where they have a large grazing property and Bill Ryan junior is a Veterinary Surgeon in Calwell. The woolshed on Merino Vale was built in the early l970’s for the Majors by Cecil Guy. Cecil worked on Old Kowen, Millpost and Murryong in the 1977-81 period and he was a good horseman, being involved in the Show Society, polocrosse, race club, rodeo, etc. at Bungendore. He later purchased a farm in Summer Hill Road in the Geary’s Gap area. In the 1970’s the Majors had some Brahman cattle and once a Brahman bull got into our Mud Hut East paddock. According to my diary it was on the 6th October 1977 that a Brahman bull chased Cecil Guy on his stock horse and the bull appeared taller and faster than the horse and rider. Cecil was flat strap to avoid the horns of the bull. That happened near the Yass River and south of the present location of the intersection of Norton Road and Weeroona Drive on a big flat paddock. In the 1930s some graziers were making more out of rabbits than they were out of wool. My grandfather was trading sheep and he had big mobs of sheep on the road going long distances such as to and from Goulburn or Cooma. In the l930’s if you were driving down a very steep hill such as Norton Road near Sutton Road you would need three things—a foot brake, a hand brake, and a tree stump tied to the back. Back in the 1970’s a bushfire took off in Dr. Shepherd’s after a bulldozer knocked down a tree which brought down the electricity power line. Jack Welch was driving the dozer and Nita Welch was alone at the house, say two miles away and she noticed a brown out and then a bushfire going up like an atomic bomb. It was about May, 1975, and she could not drive or contact Jack and feared he had either been electrocuted or killed in the fire and she raced over the paddocks towards him. She was at Murryong outstation in Wamboin and he was over near Ryan’s Road. Fortunately he was safe. Battling the bushfires, planting pine trees, and raising six children took its toll and his health suffered in the late l970’s. He left Wamboin and the Welches continued to live over at Murryong until the property was sold in 1989. In the l970’s Tim Booth and Elaine Wagstaff lived in the cottage on Merino Vale. Tim has been a science teacher at Queanbeyan High School for many years. I was visiting them one weekend and saw the Majors mustering their cattle. Bill Major was trotting 100 meters behind the mob on a small grey pony and Mrs. Judy Major was mustering the mob at high speed in the family Ford Fairlane. The Bingleys purchased land from my grandfather that now belongs to Bruce Shepherd in the area south of Ryan’s Road. The Bingleys still own land down on Sutton Road and they are beekeepers, wool growers, and haulage contractors. They are a large family and I have less information on them. There are mud huts in the Kowen Forest area, a stone house near Molonglo River, a pise house ruin near Merino Vale cottage, and a workman’s hut built in the 1930’s on land near Kowen Forest. In the 1960’s Jack Welch planted oats and wheat on Old Kowen also known as Murryong outstation. A carrier, Ray Guy, carted a load of wheat out past Majors and over to Mac’s Reef Road via Birchman’s Gully, owned by Bob Denley at that time. Before Norton Road was built it took about an hour or more to get to Canberra because you had to travel over dirt tracks and paddocks opening many gates, going through Birchman’s Gully and Macs Reef Road. Jack Bish would ride his horse around Old Kowen and Millpost nearly every working day between 1955 and 1977. He would venture onto Wamboin land if our sheep or cattle had escaped. The Shire includes Old Kowen (Murryong Outstation) as South Wamboin on their planning maps. In recent years Greg Webb has been working on Old Kowen building a woolshed, electric fences and helping with stock work. He used to work full time on Lanyon in the I970’s. Now he freelances as a rural fencer and occasionally works for John Fraser of Merino Vale Drive. In my diary of 31 July 1975 I have a note saying that Mrs. Judy Major rang Dad at 8:30 am and said she wanted to subdivide some land. Dad said she could only have access for sub-divisions through the dedicated road on Old Kowen. This was before Norton Road and when subdivision access was proposed via a road that would come Molonglo Gorge through Kowen Forest into central Wamboin. My Dad, Peter Watson, did not want to allow this access route. In the end subdivisions developed from Sutton Road eastwards, and Norton Road grew as they occurred, starting with the land belonging to the Cartwrights, then the Bingleys, then the Armours, the Majors, and the Ryans. In my diary of 3rd May 1977 I said I went over to Old Kowen and got 8 heifers back from Cannings (Bingley Way). Whilst in there I saw two men working on a tournapull putting in a road for a subdivision. Also I saw two surveyors planning a road. People who know about Wamboin back into the 1930s would be Bill Cartwright of Sutton, Jim O’Malley of Queanbeyan and Ray Colverwell of Queanbeyan. Mr. Bill Cartwright’s great grandfather settled in this area in 1862. In about 1935 Bill’s father, Jack Cartwright and his father’s brother, Frank Cartwright, lived in portions of the family grazing property “Woodbury”, in the area of Sutton Road and Macs Reef Road. Bill Cartwright and his wife Fay still reside there today. As a way to have an extended area for grazing, the brothers bought 1400 acres of land in the area now traversed by the western portion of Norton Road. Roughly, the area was a rectangle extending north from Kowen Forest to a couple miles north of the present Norton Road, bounded on the west by the ridge just east of Sutton road and extending eastward to about the present Canning Close. The Cartwright brothers were given the money to start the purchase by their uncle, Jimmy Dunn, who won the Queensland golden lottery prize of £50,000. They bought the land from Tom Gallagher, a man who had owned it for a long time, perhaps since before 1900. By 1935 he was getting too old to carry on with the work of managing sheep on the land. 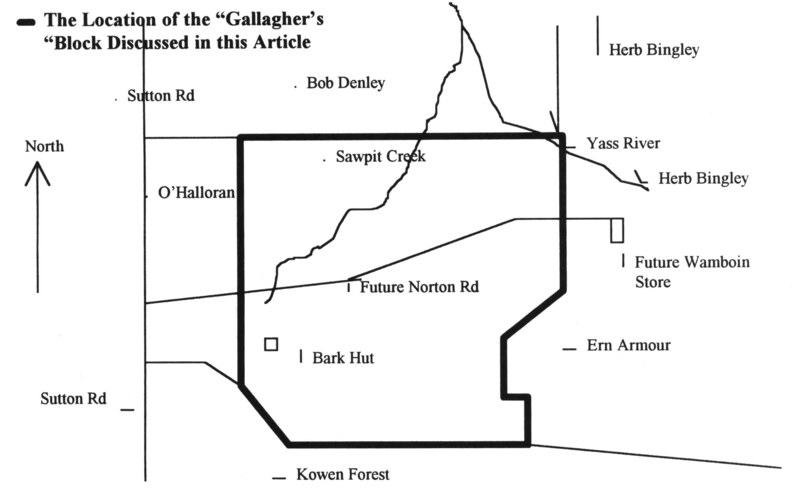 Some members of the Gallagher family lived near the Molonglo River crossing on the Kings Highway about 10km west of Bungendore. The 1400 acres of land they purchased in the Warnboin area was good wool growing land, as it had already been cleared. It supported 1000 to 1100 wethers. There is a old building site on the land, now located west of Cooper road and south of Norton Road, called "The Bark Hut". Only a stone chimney remained in the 1950s. Bill Cartwright remembers camping there for six weeks in the winter in 1947, with his cousin Jerry and a pack of dogs. They were there to carry out rabbiting and scrubbing. One night a snow storm came and left six inches of snow. One problem of the Gallagher’s block was that it was “landlocked”. The Cartwrights could only get into it “through the grace of others” either by way of the Kowan Forrest Road or through Bob Denley’s property to its north. Bill remembers that to get the 1000 or so wethers sheared and dipped they had to be nun all the way northward to Bob Denley’s property, then out onto Sutton Road about halfway between the present Norton Road and the Federal Highway, then north along Sutton Road to the shearing shed at Woodbury on the east side of Sutton road about two kilometres south of the Federal Highway. In the 30s, 40s, and 50s Macs Reef road was a very rough gravel road. It carried only about 20 cars a day. The road was not fenced, so the sheep roamed on the road and cars stopped for them. Formerly there was a large property called O’Halloran’s along the east side of Sutton Road from the ACT border to about the spot of the shearing shed. The shearing shed can also be located as being opposite the Cooper’s house on the west side of Sutton Road. Mr. O’Halloran owned the property, but a shearer named Glen Smith leased it from O’Halloran from about 1935 to about 1980. O’Halloran also bought other land close to the ACT boundary, including large tracts near the present Queanbeyan railway station and at Environa near Hume. Blocks at Environa were sold to people from as far away as England and South Africa. The property on Sutton Road north of Norton Road was purchased around 1980 by Athol Morris, a panel beater from Canberra. The Cartwrights would go onto Gallagher’s, the large Wamboin block, only about once a month to muster or to build or repair sheep yards. The area was very quiet, with the only sound coming from birds and a few aeroplanes a day. It was “an isolated area, completely quiet and still.” In the whole area bounded by Sutton Road on the west, Kowen Forrest on the south, Macs Reef Road on the north, and the Lake George Range on the east, there would only have been about ten houses well into the 1960s. These included Jack Welch, the bulldozer driver, a couple of houses on the Watson’s land, Glenn Smith’s house on Sutton Road, 3 or 4 houses on Sutton Road belonging to the Bingleys, the Cartwrights’ houses, Gordon Bingley near Kowen Forrest on land he bought around 1950 from the Hyles family, Bob Denley and the Harriots in blocks just south of Macs Reef, and the Riordans in Clare. The Cartwrights when working their Wamboin (Gallagher’s) block would sometimes run into a saw miller named Rayner who used to take out logs. There is in the area a creek called Sawpit Creek, flowing northeastward from the west side of the ridge just east of Sutton Road to the Yass river, meeting it about 6km south of the present Macs Reef bridge. Timber logs were taken from this area and this may have been the reason for the name of the creek. Raynor was a saw miller at Queanbeyan and collected logs from Gallaghers. Bill Cartwright doesn’t know whether Raynor had a sawmill there or not. A short little railway was ported into the bush near the cutting areas to use for running the logs into a saw operated by Les and Herb Bingley to cut timber for the Cartwrights about 1950. Various woodcutters took a lot of wood, especially Stringybark and Red Box, out of the area to customers in Canberra and Queanbcyan. Much of it went to a woodyard near the War Memorial. Some persons involved in woodcutting were Stan White, who used to live in Sutton, and the Webbers of Queanbcyan. Trees were cut into 6 foot lengths using axes, with the bigger logs split to make them lighter. In Canberra they were cut down further into fireplace logs. Bill believes that all of Wamboin, now bare of trees in many places, was once quite forested. Like most graziers,the Cartwrights removed many trees, as it opened up the land for sheep. At least one of the local graziers tried to remove all trees. The Cartwrights did not follow this approach. They felt that leaving some trees was wise. Trees provided protection for the sheep, so that they did not use as much of their energy to keep warm, needed less feed and stayed in better condition through the winter. Trees also prevented the land from drying out as fast in hot summer winds, and hence kept the pasture in better condition. Mr. Cartwright’s grandfather paid a man to ringbark most of the trees in one area, and asking him to leave some untouched for these reasons. The man later boasted to other people that he had ringbarked every single one. Mr. Cartwright’s father, Jack Cartwright, died in 1966. His mother and his sisters owned the land, and Bill Cartwright and his brother worked it for them for about three years until 1969. They then sold it to a developer. The developer had previously bought the O’Halloran’s block, along the east side of Sutton Road just north of the ACT border. The two blocks together provided sufficient land for subdivision, the beginning of the new subdivided Wamboin. Norton Road was started in 1970 or 1971, and extended up the big hill from Sutton Road and a bit further after passing over the hilltop. Bill Cartwright believes it was always sealed, and he does not believe the shire would have allowed such a steep road to go in without being sealed. The Cartwrights knew the Hyles Family and the Watsons, but had little contact with them. “We were Sutton people and they were Queanbeyan and Bungendore people.” The Hyles would come into the land from the Kowan Forest or Kings Highway end, and, like the Cartwrights, only occasionally when required for mustering, sheep yard construction, or other grazier’s work. Bill Cartwright supports a story from James Bingley about shooting wild pigs in the area. He also remembers many occasions, especially during the winter, when kangaroos were culled. Kangaroos ate the same grass that the sheep ate, and hence cut into the graziers’ livelihood. The shoots never killed off all the kangaroos, but kept their numbers down to about 20% of what they are today. The kangaroos were also deterred then by the absence of water. Today Mr. Cartwright notes, on a morning plane flight from Canberra to Sydney the area glitters with reflected sunlight from hundreds of dams, which the kangaroos use for water. Bill can also remember a smaller fire that burned around 50 acres around 1948. It was started by a wood carter boiling a billy beside a dam. Floods often took out the fences. The biggest flood Bill can remember was in 1982. As in most of the floods, the river rose quickly and dropped quickly. Mrs. McGlaughlin, who was living at the Rudds at the time, woke up in the middle of the night and went into her kitchen and looked out the window. The rain had ended and the sky had cleared. Mrs. McGlaughlin was amazed to see, lit up by the moon, an enormous body of water between her and the Cartwrights. The next morning the river had already receded substantially but the line of sticks left by the flood crest went 200 meters into the Rudds’ land on the east side of the river and 100 meters into the Cartwrights’ land on the west side of the river. Bill wonders about the new bridge. Because it is an arched bridge rather than a shallow crossing, in a really big flood it may act as a dam. It could force water back over his farm and the others just upstream of the bridge. The really big floods happen very quickly, lasting only 30 minutes to an hour, but in that amount of time the new bridge could cause considerable damage by damming up the river if there is so much water that it cannot all fit under the arch. Bill thinks the Rehwinkles, who ran the animal farm until a couple years ago, bought their land about 20 years ago. The same land was once part of Woodbury, owned by his grandfather and his grandfather’s brother. Bill has never heard any stories about aborigines in the area. The only accounts he has ever heard about aborigines deal with the Orroral and Urriara areas now in the ACT. The Sutton Fire Brigade was officially formed in 1951. Before then firefighting was done by private people, usually with beaters, and, as time went on, with their own pumps and trucks. Getting help was in some ways easier, because in those days everyone’s phone was plugged into the Sutton exchange. All the plugs could be plugged in at once and then all the phones in the area would ring simultaneously to allow the news to be quickly spread. A number of people could arrive within ten minutes, surround the fire, cut fences where necessary, and follow the line of the fire. Bill thinks that in many ways the increased population has made firefighting more dangerous. In earlier times there might be only one house on two thousand acres, and so it could be protected. Now there might be 50 or a hundred houses on the same amount of land, so a fast moving fire could endanger them much more quickly. It might be that only 4 or 5 trucks could be available in the first half hour, and l5 or 20 in two hours. He points out that people should take care to keep grass and brush away from the house, as this increases opportunities for trouble in a fire. All the settlement has in some ways made life more difficult for graziers. Some of the problems that have increased with settlement are increased numbers of kangaroos, roaming dogs, higher rates, and a greater bushfire risk. Much of the land just west of the Lake George Escarpment in the Smith’s Gap area was owned in the early l900`s by the Leahy Family. The Leahys' name for their property was Clare. It included the present Clare Valley area, the present Forest Road Area, the present Brooks Creek Estate, and a good bit of the land along Gundaroo Road between Macs Reef Road and the Federal Highway including the present Summer Hill Area. They built a house on Clare in about 1915. They also owned and lived at Elmslea in Bungendore. Pat Reardon purchased Clare from the Leahys around 1930. Pat Reardon had four sons, Bede, Paul, Frank, and Les, and three daughters, Therese (Girlie), Patricia, and Jean. The land purchased by Pat was divided up for the children. Les Reardon had the southwest portion including Clare Lane and Clare Valley. Les’ portion was about 2200 acres. Bede had the northeast portion, including the present Forest Road area, Paul had the southeast portion, between the escarpment and the present Carinya Park/Clare Lane, including the Highland Valley area. Frank had the northwest portion, including the present Summerhill Road area. Girlie married Trevor Milligan and owned the present Weeroona area which adjoined the Denley property whilst they lived in the ACT. Patricia married Jim Darmody and lived in Bungendore whilst owning land adjoining Weeroona and the Denley property. Jean married Frank Hallam and was given the original Reardon home and property “Lumley” on Macs Reef Road, near the Yass River. Paul Reardon`s portion was purchased in the late l960’s by Les, Moira, and son Tony Reardon, this including the present Highland Valley. Ray Murphy’s father, Fabian Murphy, in the late l940’s, owned 300 acres including all but the westernmost portion of the area along Norton Road, presently called Yalana. He ran about 600 wethers there. This land was not as rich as that in Clare Valley. To support himself Ray`s father also did contracting, mining, shearing, wood carting, and ran a butcher shop in Bungendore. Ray remembers working in the present Yalana area. They cleared some of the trees and superphosphated some of the land, trying to increase the value of the land for woolgrowing. They would remove trees from some areas but leave them in others. as trees provided valuable protection for the sheep. The area was good for very fine wool, anything from 16 to 20 microns. Colder, harsher areas tend to produce this very fine wool because the feed is less luscious than on better lands, and the wool is cleaner because there is less dust. This sort of wool has been prized by people like the Italians who use it to make fine wool garments. In the l960’s this very fine wool was worth “a pound a pound". Thicker wool is less valuable. At 24 microns, for example, it is classed as carpet wool. Ray Murphy started working in the Wamboin area after leaving school at age 14 in 1949. His first job was a two year stint working for Les Reardon. Pat Reardon, Les’s father, used to live at Lumley, on Mac’s Reef Road near the Yass River, but came out to Clare Valley almost every day. Les moved into the Clare house around l938 and was joined by his wife Moira in i942 after their marriage. The house still stands today, just south of Bernie Reardon’s home, “Carinya Park”. Ray Murphy, in |949-50, did shearing, fencing, and rabbiting for Les. At that time the Reardons were running about 11,000 sheep in the area now roughly covered by Clare Valley, Summerhill, Weeroona, and Damiody’s and Elmslea in Bungendore. Other local graziers such as the Donnellys, Taylors, and Southwells used the Clare woolshed for shearing. Part of the Donnelly property, the present Brooks Creek Estate, was purchased by Les and Moira Reardon in the late l950’s. Donnellys also owned the Creekborough area. In about 1954 Ray’s father sold his land in the present Yalana to Vic Southwell of Queanbeyan. Ray moved with him and worked in that area for a few years. Vic Southwell then sold the land to the Ryans and moved to the Forbes area. Ray came back to the Bungendore and Geary’s Gap area in about 1957 when he was 23. He earned his living through shearing and fencing work. In those days the fencing work was done with a crowbar and a shovel, and later on with tractors and kanga hammers. Ray remembers that while shearing for Bede Reardon in the Forest Road area, a real estate agent approached Bede and proposed subdividing some of that area into 40 acre blocks. This proposal went through and produced one of the first rural residential subdivisions in the area. This was in the early 1970s. Ray read the article in the April '97 Whisper by Frank Watson. He thinks he knows the identity of M. Flamiigan who in 1925 wrote the letter that was reproduced in that article. He says that a John Flannigan worked for him as a fencer and shearer for many years, and had an extensive knowledge of the Wamboin area. John`s father was Mick Flannigan, and Ray thinks he is probably the author of the letter. John Flannigan is about 70 now. He left this area a number of years ago and then worked for a wool classing outfit in Sydney. In the l950’s, 60’s, and 70’s there were only three northern entrances into the land just north of the ACT border, presently part of central Wamboin and Yalana. These were the rights of way along Joe Rock’s Road, Clare Lane, and the present Greenway east of Weeroona Drive. The Hyles and Watsons could access their portions of this land by coming in from entrances off the Kings Highway between Kowan Forrest and Bungendore. Landowners were reluctant to permit additional entrances, partly because by law any regular access through a section of land eventually becomes yet another legal right of way. For instance, there was no right of way into the central Wamboin area from Sutton Road until Norton Road was built by developers in about l97l. Ray Murphy has continued with contract shearing and fencing to this day, and now employs about 16 men during the shearing season. His wife Helen organises the cooking. Her father, Bill Allen, who recently passed away, worked all his life on the land and managed several properties in the Bungendore area. There are several large flocks in the greater Bungendore Area for which the Murphys generally do the shearing. Woolcarra and Foxlow on the Captains Flat Road and Currandooley on the Bungendore-Tarago Road each have about l8,000 sheep. Outside the shearing season Ray organises crutching and fencing work. He has also trained and used numerous sheep dogs over the years. Ray notes the enormous increase in kangaroos in recent years and believes there should be more culling, as the kangaroos cause many car accidents and consume much of the available grass. He says that previously kangaroos were culled, but there was never a desire to eliminate them altogether. He also remembers spending time rabbiting in his earlier years. The rabbits were a pest because they consumed pasture and dug holes. It was possible to make a living trapping rabbits. Good trappers would set a line of |00 traps. Most of these would catch a rabbit by mid afternoon. They could be emptied and reset to catch another by morning, giving a total of about |50 rabbits per day. Buyers would come in once a month to buy the skins for a cent a skin. Many of the skins went into Akubra hats. Wild pigs have also been plentiful in the Wamboin/Geary’s Gap area, and Ray Murphy says there are still some around today. He has never heard of any koala sightings in the Wamboin area. The Majors, in the early l960’s, bought the land in the present Norton Road, Merino Vale Drive area from the Harriotts who lived on Macs Reef Road. Ray Murphy remembers introducing Cecil Guy to them. Cecil built the shearing shed which now sits alongside the old cottage just northwest of the Weeroona Drive/Norton Road intersection. The cottage had already been there for many years by that time. Ray also did the shearing for the Majors, and remembers they had about l800 sheep at Merino Vale. The Majors lived in Canberra, but stayed in the cottage occasionally. Ray also notes that much of the Wamboin/Geary’s Gap shearing was done in the shearing shed that still stands just south of the intersection of Macs Reef Road and Gundaroo Road (since renamed Bungendore Road). The flocks from the Ryans, the Taylors, the Donnelleys, the Reardons, and from Lumley were brought there. Ray has watched over the years as subdivisions sprout up on lands previously used for grazing. The money to be made from subdividing often outweighs the ever increasing cost of wool growing, where costs keep increasing in areas like wages, selling costs, drenches, and insurances. Les Reardon served for many years as a Shire Councillor. In about 1990 he sold the present Clare Valley area to Asset Developments Pty Ltd, who developed the 70 rural residential blocks in the valley. The Ryans kept the land in the present Yalana and ran stock on it until about 1990. Around that time Bill Ryan bought the westernmost portion of Yalana from the Majors so that he could extend Norton Road eastward from its then terminating point at Weeroona Drive, in the land subdivided by the Majors. This enabled the rural residential development of the Ya|ana area. Eventually the stretch of Norton Road in Yalana was linked at its western end with the stretch of Norton Road for the rural residential development in Clare Valley. Les Reardon died a few years ago. His wife Moira lives in the area, as do several of his sons and one daughter. If you peruse the old 19th century parish maps of Wamboin, you may notice an anomaly: a two-acre block set among the many 40-acre-plus selections in what we know today as Clare Valley. It is the site of the Wyanga school. It lies between Reedy Creek and the track that formerly ran from Queanbeyan north-east to join the Gundaroo Road (what we now call Bungendore Road) immediately south of the Bungendore Road/Macs Reef Road intersection. Today’s Weeroona Drive follows part of that old track. The school site is on private property east of the sharp curve in Weeroona Drive, three kilometres from Norton Road and 2½ kilometres from Denley Drive. …an isolated and tiny community of struggling selectors in the Lake George Ranges, about twenty miles from Queanbeyan. Although a surveyed road from Bungendore to Gundaroo ran close to the settlement, communications were inconvenient because the pass through Smith’s Gap which today simplifies travel from Bungendore through Wyanga to the modern Federal Highway was not then in existence. With Bungendore only a few miles away, the only link was by horseback or on foot. To the north it was far easier to travel to Gundaroo, about sixteen miles distant, and westward there was a rough track connecting with the busy town of Queanbeyan. The school site appeared on various maps dating from the earliest parish map (1881) to at least the 1967 County of Murray map where it is shown as ‘WAMBOIN P.S.’ (NSW Dept. of Lands 1967). In the 1870s, when the school was established, a small number of large land holdings (each of one square mile) were found in the area, though most of what is now Wamboin was small blocks: selectors’ conditional purchases. Plumb was born in Calcutta/Kolkata on 14 Nov 1827. He was a commissioned officer in the 6th Bengal Native Infantry, based in Calcutta, and subsequently emigrated to NSW around 1857 and found employment as a clerk in the GPO, Sydney. He commenced working as a teacher in the Manning River region of NSW in 1859, and while there qualified as a teacher. The following year he commenced teaching at a private school near Cassilis, moved to Muswellbrook in 1866 and later established a private school in the Goulburn area for the children of the people building the railway. He had a reputation for ‘arrogance, snobbishness and irascibility’ (Lea-Scarlett 1972, p. 4) which, along with his propensity for heavy drinking and consumption of tincture of opium, underlay the poor relationships he had with many of the communities within which he lived and worked. The descendants of some of these families still live in the Bungendore area, and are active contributors to the Bungendore History Facebook Group. The Lake George Ranges consist of wild hilly country through which there is no mail communication. On visiting the place (which I was induced to do at first from hearing of the beauty of its mountain scenery) I found on it a scattered body of free-selectors, almost all wholly illiterate, with children growing into men & women in utter ignorance. My proposals for a school found favour with them (quoted by Lea-Scarlett, loc. cit.). Lea-Scarlett explains that Plumb’s ‘…time at Wyanga was his most prolific period as a writer and the result is that from his pen came the only descriptions of the locality in those times and some careful analyses of social conditions’ (loc. cit.). The school was built in early 1870 as a slab and bark hut measuring 30 feet by 15 feet, with a small room attached in which the teacher lived. At the time of writing his 1972 Memorial Lecture, Lea-Scarlett noted that the building ‘…is still in existence, although now more deservedly used as a shed on the farm of Mr Patrick Mathews at Turalla Reserve, Bungendore’ (op. cit., p. 8). His paper includes a photograph of the shed as reconstructed there. It still stands on the property ‘Turallo Reserve’, visible from Mathews Lane. Plumb (an Anglican) found himself in the midst of bitter conflict between the Roman Catholic and Anglican selectors in Wyanga, and his own behaviour (including his heavy drinking) exacerbated conflicts he had with the local selectors and with the Catholic hierarchy. The school opened as a private school in early 1870, though later in the year it became non-viable as the Catholic pupils were withdrawn by their parents. The only pupils remaining were those of John Lee and Thomas Smith, and those men provided some financial support to Plumb as their private teacher. In early 1871 a Provisional School was established in the single building that then existed in Sutton, a weatherboard building used as a Wesleyan chapel that had been moved there from the Mac’s Reef goldfield once the village of Newington was dismantled. Plumb was appointed as the teacher there, with some sources (e.g. Gillespie 1999) stating that the Sutton and Wyanga schools were half-time schools, with Plumb attending them on alternate days. Conflict and chaos reigned, however, with Plumb’s appointment to the Sutton school ending in September 1871. He again became a private tutor to Smith’s and Lee’s children as there were not enough pupils for the Wyanga school to be viable as a Provisional or Public school. In August 1872 the Dept of Education recognised it as a Provisional School, with the teacher being Mrs Mary Whyte, the daughter of selector Edward Murphy—she had no teacher training. By this time Plumb had left Wyanga. The school closed, never to re-open, in December 1874. In the same year the land surrounding the school site was selected by Michael Byrnes, as can be seen on the early maps, though the school site remained excised from the selection. As you walk, ride or drive along Weeroona Drive, at 3 km from Norton Road and 2½ km from Denley Drive, look to the east, down towards Reedy Creek, and think of the selectors’ children walking, or perhaps riding their horses, to Wamboin’s Wyanga school, some 150 years ago. I do! Samuel Elphinstone (sic) Plumb: August 1871 to May 1872; Mrs Mary White (Lea-Scarlett spelled it ‘Whyte’): June 1872 to July 1872; Mrs Mary Anne (Lea-Scarlett spelled it ‘Ann’) White: August 1872 to December 1874. Source: Gillespie 1999. Note that some of these details differ from those provided in Lea-Scarlett 1972. Much of this article draws on Lea-Scarlett, EJ 1972, ‘Magnum Bonum Plumb--terror of the Australian bush. A study of the teaching career of Samuel Edmonstone Plumb’, Descent, vol.6, pt.1, T. D. Mutch Memorial Lecture, read before the Society of Australian Genealogists, 17 August 1972, pp.3-29. Parts of the Lecture’s content is summarised in Lea-Scarlett, EJ 1972, Gundaroo, Roebuck Society Publication no.10, Roebuck Society, Canberra, pp.68-9. Lord, R 1996, Sutton Public School: 125 years of education: 1871-1996, Sutton Public School, Sutton, NSW. McDonald, D 2018, ‘The parish of Wamboin: its creation and the parish map’, The Whisper, November 2018, p.20. New South Wales, Department of Lands 1967, Map of the County of Murray [cartographic material]: Eastern Division, NSW compiled, drawn & printed at the Department of Lands, Sydney, NSW, Dept. of Lands, Sydney. ‘Wyanga’ is almost certainly an Aboriginal word. Sutlor (1909) recorded that ‘wyanga’ is from the Port Jackson language, meaning ‘mother’. This is reflected in one of Australia’s most respected Aboriginal community-controlled health services, the Redfern-based Wyanga Aboriginal Aged Care. They refer to ‘Wyanga (Earth) Malu (Mother)’ and ‘Wyanga: “Mother – the core of Aboriginal people’s spirit”‘. Various dictionaries of Aboriginal words, published after Sutlor’s piece, also refer to ‘wyanga’ meaning ‘mother’ in the Port Jackson language (e.g. Thorpe 1921). Also in Sydney is the Aboriginal cultural tour company Wyanga Malu, which they translate as ‘Earth Mother’. Wyanga is also a rural locality and railway station in central NSW on the Parkes-Narromine railway line, 26 km south-west of Narromine. This location is in the traditional country of the Wiradjuri people, and we note that one of the two founders of Redfern’s Wyanga Aboriginal Aged Care, Sylvia Scott, is a Wiradjuri Elder from Cowra, NSW (http://wyanga.org.au/our-historystory). There are a number of places called Wyangan in and around Griffith, NSW, and others called Wyangala, e.g. Wyangala Dam and village on the Lachlan River near Cowra, and Wyangala National Park, also in the upper Lachlan. And note Wyangala parish in the Boorowa (Hilltops, since the 2016 NSW Council amalgamations) LGA. In addition, across eastern Australia are found many businesses, roads, properties, etc., called Wyanga, including a pastoral property in central Queensland near Tambo, and a winery in Gippsland. Sutlor, JB 1909, ‘Aboriginal place names. Vocabularies by J. B. Sutlor, of Bathurst’, Science of Man and Journal of the Royal Anthropological Society of Australasia, vol.11, no.8, pp.160. Thorpe, WW 1921, List of New South Wales aboriginal place names and their meanings, Australian Museum, Sydney. I am not aware of any published account of the boundaries of Wyanga during the period when the locality name was commonly used. Based on Lea-Scarlett’s naming of the families whose children were candidates for the Wyanga school, and the locations of their selections relative to the school site (detailed below), it seems reasonable to suggest that the rough boundaries may have been the Lake George Range to the south and east, the middle of the current Bywong parish to the north, and the vicinity of Merino Vale Drive to the west. Such boundaries are less than five kilometres in a direct line from the school, a not-unreasonable distance for the pupils to travel. The earliest land acquisitions in the area were by William Moore and William Guise, in 1838. Moore purchased a one square mile (640 acre) block that he named ‘Creekborough’. Its south-western corner straddled the current Bungendore Road/Macs reef Road intersection. Note the current Creekborough Road named after his property. Also in 1838, William Guise, proprietor of ‘Bywong’ station in the Sutton/Gundaroo area, purchased (at auction) two abutting one-square-mile portions of land on Kowan Gully (Kowen Creek), south and west of the current Wirreanda Road. James (and his brother John?) Anlezark also had a 640 acre block. This was on Brooks Creek just north of the top of Smiths Gap; the Forest Road/Forest Lane intersection was the north-eastern corner of his block. James Anlezark is said to have purchased it in 1837 (Aubrey & Jenner 2011). The selectors moved in following the passage of the Crown Land Acts in 1861. The earliest published mention of ‘Wyanga’ that I have found is the NSW Government Gazette of Saturday 31 Oct 1868 [Issue No. 271 (Supplement)], p.3815: Registration of Brands Act of 1866, Brands Branch, Registrar General’s Office: ‘Third list of cattle brands—third notification: … Wm. Smith, Wyango, Bungendore’. Lea-Scarlett identified William Smith as being one of the selectors in the area in 1870 (see above) and Smiths Gap is named after one of the two William Smiths (father and son) who lived in Wyanga, probably William John Smith (1824–1896). The next mention was in the NSW Government Gazette dated 10 April 1879, a notice of a horse having been impounded ‘from Wyanga, by John Lee’. The Bungendore cemetery index includes Catherine Sparrow née Lee, birthplace ‘Wyanga, near Bungendore’, died 04 Apr 1899 at Bungendore, aged 35 years, father John Lee, mother Mary Jane Harriott. Catherine Lee would have been born at Wyanga c. 1864. In Bert Sheedy’s 1971 interview of Pat Mathews (‘Turalla Reserve’, Mathews Lane, Bungendore), Sheedy mentioned Wyanga twice, albeit very briefly, as if it was (to him and Mathews) a familiar name for that locality. See the 9 minutes 0 seconds point in Session 1, and 26 minutes 50 seconds in Session 2. Source of the names: Gillespie 1999, p. 69. Selections in SE corner of Bywong parish immediately east of Creekborough (William Moore) and north of John Anlezark’s block (Wm Smith ACPs 1873, 1874, 1882) Other Smiths there as well, including Thomas Smith and TW Smith. Smiths Gap was named after a William Smith. I cannot find any blocks in his name within a few miles of the school. Blocks on the eastern side of Brooks Creek between it and the escarpment, Bywong Parish, CP 1864, ACPs 1873 1874 1875, 1879, 1881, 1882 and 1890, about 3 miles NE of Wyanga school. Selections immediately north of Lee’s, i.e. in the triangle of Macs Reef Road and the (Weeroona area) crown road. Also immediately NE of Moore’s ‘Creekborough’. CPs 1880 & 1881 (J Walker), ACP 1888 (J. Walker Jr). Purchased ‘Creekborough’ from William Moore. Walker was from County Kildare. His brother James married a girl who was a Souper. In Ireland, these were Catholics who, if they renounced their faith they were given a bowl of soup and automatically became Church of England. At the time of the 1804 Fenian uprising John Walker was said to have informed on the (Catholic) rebels. Three men were appointed by the Fenian Brotherhood to follow Walker to Australia and kill him which they did during a wallaby hunt on ‘Bolero’ station (near Adaminaby). It is believed that McCoy (squatter at Wanniassa) come out to Australia first and may have brought the information about James Walker being a traitor. Because of this family experience, John Walker never went outside his house with unless he was carrying a double-barrelled shotgun. Source: Lea-Scarlett 1972. Cannon (2015) states that he received the first land grant in the parish of Wamboin, 33 acres, 10 Sep 1857 (well before the parish was created). See his block, parish no. 9, 30 acres, the top-right-hand corner touches Bungendore Road at the northern parish boundary, one mile north of the Wyanga school. Also blocks south of upper Yass River/Cohen Creek, including CP 1879, ACPs 1881, 2 miles from the school (i.e., the current Merino Vale Drive area). Obviously, this was not the first land grant in the parish of Wamboin depending, though, on what definition of a land grant and of the parish of Wamboin one uses. The school block is on one of his selections, 1874. His other nearby blocks were selected in 1870 and 1875, and he had a land grant (?) of 47-3/4 acres straddling the creek immediately north of the block which surrounded the school. Thomas Smith had many selections on and close to Brooks Creek, near the Lees, south to the parish border, about 2 miles from the Wyanga school. Aubrey, K & Jenner, K 2011, The story of John Anlezark & Mary Anne Doyle 1812-1889, the authors, Hazelbrook, NSW. Cannon, Geoff (compiler) & Department of Land and Water Conservation New South Wales (issuing body) 2015, The first title holders of land in the County of Murray, the author, Green Hills, NSW. Gillespie, LL 1999, Early education and schools in the Canberra region: a history of early education in the region, The Wizard Canberra Local History Series, L. Gillespie, Campbell, ACT. Lea-Scarlett, EJ 1972, ‘Magnum Bonum Plumb--terror of the Australian bush. A study of the teaching career of Samuel Edmonstone Plumb’, Descent, vol. 6, pt. 1, T. D. Mutch Memorial Lecture, read before the Society of Australian Genealogists, 17 August 1972, pp.3-29. Parts of the Lecture’s content is summarised in Lea-Scarlett, EJ 1972, Gundaroo, Roebuck Society Publication no. 10, Roebuck Society, Canberra, pp.68-9. Mathews, P 1971, Pat Mathews interviewed by Bert Sheedy for the Bert Sheedy and Marj Sheedy oral history collection [sound recording], recorded 16 January 1971, at ‘Turalla Reserve’, NSW.